Glasgow, Scotland: Global Minorities Alliance has condemned the Indian police violence against peaceful Sikh protesters last week who gathered in a peaceful protest when pages of Guru Granth Sahib, the holy book of Sikhs was ripped off which led to protests across Indian state of Punjab. Last week, Police used water canons and batons to disperse the crowd and opened up fire to the peaceful protesters which lead to the death of two Sikh protesters. ‘We utterly condemn the desecration of holy Sikh scriptures in India and the subsequent police violence against the peaceful protesters which is against the fundamental rights of any democratic country. India must protect the lives of millions of Sikhs than to attack, abuse and use force against its own citizens’. Mr Khan further maintained: ‘The recent incident of state callousness against peaceful Sikh community is yet another episode of how Sikhs are being treated with utter disregard of their religious sensibilities against its international obligations. Global Minorities Alliance joins the world community to condemn state-led violence against Sikh community in India and calls for respect and protection of its all citizens. 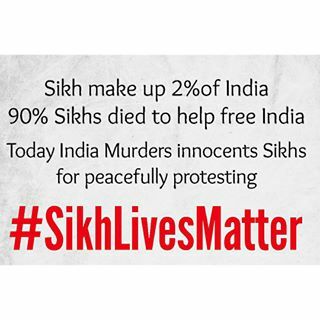 This entry was posted in equality, From GMA, India, Minorities, Sikh, Uncategorized and tagged #HumanRights, #SikhLivesMatter, #Sikism, persecution, UN by BlogGMA. Bookmark the permalink.